Backhousia are a small group of trees often referred to as ‘Myrtles’ , as a genus it provides some excellent garden trees and some widely used street trees. All are found along the east coast of Australia most from Queensland to New south Wales. They have proved to be an adaptable group of plants ranging from around 4m to 10 m in height depending on the species. They make good hedging plants for an informal look and are also useful as small street trees and background plants in the garden border. Some species such as B. citriodora are also used for the strongly scented leaves which are dried and crushed for use in a range of food products. B. bancroftii is perhaps the largest growing reaching around 10m in height. B.myrtifolia is lower growing. Other Backhousia species are used as screening plants, small feature trees and in landscaping projects where hardy adaptable trees are required. 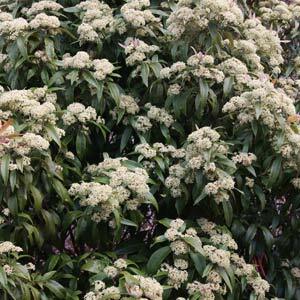 All have bushy foliage and all produce masses of creamy white flowers in spring.